Stacy Tornio sits down with Lake Effect's Mitch Teich. Sometimes all we need to rejuvenate our minds, bodies and spirits is a bit of fresh air. Fortunately our outdoor adventure contributor, Stacy Tornio, has created a concept that utilizes the nature that surrounds us. Tornio says her plan, called the 21-Day Recharge, "is really just a way of getting outside for 21 days in a purposeful way. You can't count walking into Target, or even walking the dog...it has to be above and beyond what you'd normally do." The concept originated as a way to get kids outside to play and interact with nature, but Tornio notes that "it works for adults, too." In a world where people live such busy lives, we don't think we have time to get outside, she says. "Even if it's 15 minutes, even if it's that walk after dinner or taking time on your lunch break," Tornio says, "it's amazing what that can do and how that can just brighten your day." She notes that even doctors have prescribed nature and sunshine to patients to get outside. 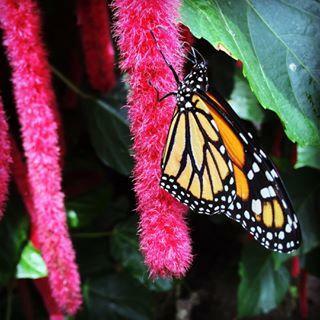 Monarch butterfly on a Shrimp plant. Wisconsin, however, isn't always a sunny oasis of chirping birds. But even on those challenging days, when she and her kids just wanted to plop in front of the TV after dinner, Tornio says she's happy about her choice to do otherwise. "We go out, and I find that it actually gives me more energy. So, whenever we come back, I have energy to do the dishes, or hang out with my kids," she says. Tornio has been chronicling the experience with photos on Instagram, under the hashtag #21DayRecharge, and on Twitter. 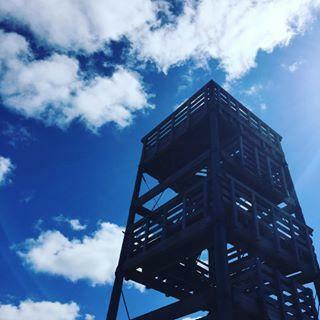 Lapham Peak Park tower on a sunny day. Some of the experiences that Tornio have tallied up with her family include going to Lapham Peak to climb the tower, observing muskrats and finding a park off the beaten path to play basketball. She says the intent of the recharge is also to spark a sense of adventure that reaches beyond 21 days. Even before the period ended, Tornio and her kids made a plan of "going out to somewhere new once a month. Whether it's a day after school or on a weekend, going to a park we've never been to, visiting a body of water we've never gone to. Just to experience things in new ways." Tornio is the author of nearly a dozen books related to nature, gardening and getting kids outside. She also runs the website DestinationNature.com. For an urban city, Milwaukee's got a lot of nature around. While the calendar might not say it, we tend to think of Memorial Day as the unofficial start to summer. Colleges are out, many pools have opened, summer sports seasons have started, and we are all spending more time outdoors. At least, we should be. But as many have pointed out, a lot of us - kids in particular - don't get outside and explore as much as we used to. 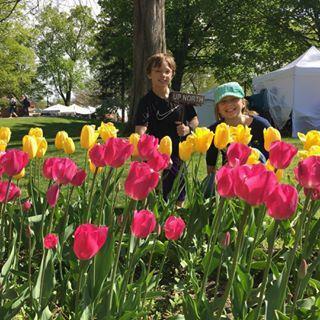 As Earth Day approaches, Stacy Tornio of the Destination Nature has some suggestions for getting outside this week. In early springtime, you can see daffodils, pacifica, tulips and lilacs. "Even though it's kind of bare out there, the flowers you do see are so bright and fresh and its makes you happy," says Tornio.